Our fellow hackers at i3Detroit came up with a great idea: the Unusual Musical Instrument Jam Session. The premise is simple: you come to the hackerspace and bring anything you have that makes noise, whether it was intended for musical purposes or not. You get together with everyone else who has also brought their favourite noise-making objects, and improvise some music together! They’re hosting this event at their space on the evening of January 8th–and suggested that we do it synchronously with them. So, we shall! You are invited to join the Pumping Station: One Cacophony Club at 7:00pm on Friday, January 8th for the Unusual Musical Instrument Jam Session! 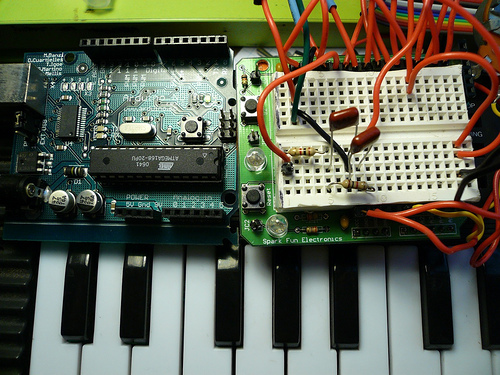 Bring anything you have that makes noise: Arduino concoctions, your voice, circuit-bent toys, traditional instruments, synthesizers–if you can create sound with it, it’s welcome! We’ll jam out, goof off, and show our friends at i3Detroit (as well as each other!) what we can do with objects that may or may not have been designed to make music in the first place. This event is free, and open to members and guests alike. This looks like so much fun! Wish I could be there! Props to the person who brings in a keyzookalele. Sounds awesome! I hope I can make it out. How late will this event go? I work till 9 or 10p, but definitely want to check it out. How did you guys assign images to your account? I see no place to do so in the profile editor. Nathan, that indeed is a dumb question. We are using “gravatar.com” it links a profile picture automatically to registered email addresses. DUH.